There was a time when the body represented in all its glory, the hard work and time that an individual dedicated to crafting it. It was a time when people stared in awe at the chiseled physique of these Greek-God-like men who walked among us, giving due respect to the effort it had taken to realize it. Then the era of steroids hit, and all of a sudden, people who had held the discipline and sport of bodybuilding in the highest regard stopped altogether, deeming that it was not really a sport but rather a competition to look the biggest. The desire to be the biggest, in place of attaining symmetry and the illusion of size took over as the primary driving factor, leading to the genesis of the present-day mass monsters; men who hold unnaturally large amounts of muscle mass beyond what the body is naturally capable of. 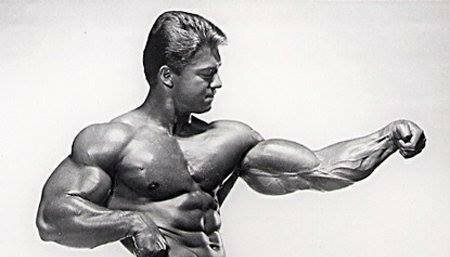 Luckily, as more and more people are becoming educated about the true origins of bodybuilding, there has also been an ever increasing number of those interested in doing things the natural way using the wisdom of old school training, which was all revolutionized by one major player. When people think of bodybuilding, one of the first faces to pop into their minds is the iconic Arnold Schwarzenegger. And an icon he is, as he served as a major motivating factor for many current day bodybuilders, but there was one man who served as his predecessor. In fact, this man was Arnold’s first trainer, no other than the legend and myth, “The Iron Guru” Vince Gironda. Vince Gironda became a household name mainly due to the fact that he was a trainer of the stars (many Hollywood actors), but also because he always went “against the grain” of conventional beliefs and training modalities. 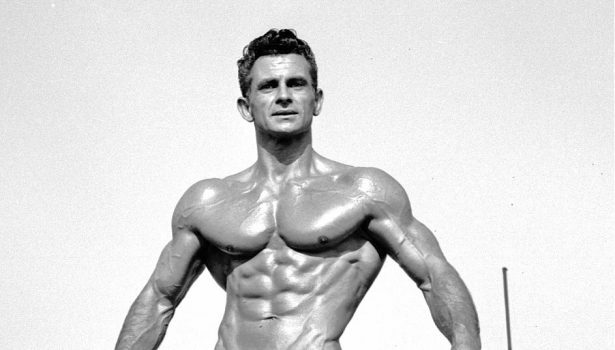 His student Larry Scott even went on to be crowned the first Mr Olympia in 1965, proving that his techniques had merit. What Were Vince’s More Unorthodox Principles? For one, he was one of the earliest and most vocal advocates of diets low in carbs and high in fat, something that yields massive changes in body composition, but which is still not broadly accepted by the bodybuilding community. To add to that was the fact that he sternly believed that bodybuilding success was due to placing 85% of effort on diet, and just 15% on actually training, as growth primary happens throughout the day and not while in the gym. Regarding training techniques, he did not have a squat rack in his gym, based on the assertion that regular back squats heavily emphasize gluteal and hamstring development, compared with the sought after quadriceps sweep and flare. Instead, he opted for the sissy squat. 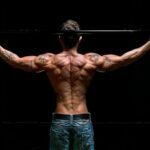 Likewise, he also despised the standard flat bench press, as it emphasized too much front deltoid recruitment, which led to premature fatigue while training. Vince was also strictly against steroid use since he said that they promoted abnormal muscle growth, and led to a loss of symmetry. He believed so strongly that diet could change a person’s physique, that he even developed specific dietary techniques which would accelerate muscle gains and a ripped physique. Let’s see what tidbits of knowledge he left for us, which are still applicable to this day. The basic tenet of the hormone precursor diet was to boost hormone production to a level as high as naturally possible. The number one way to do this? 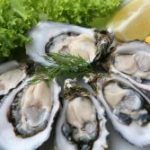 Increase healthy fats consumption. 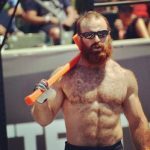 This fits well into Vince’s philosophy of low carb and high fat, with studies now even confirming that low-fat diets are detrimental to testosterone levels. 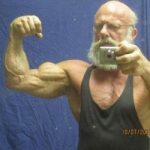 Gironda sternly believed that diets high in fat and protein were superior for muscle growth, proving that he was on to something long before studies confirmed it in recent days. One or two pounds steak or other roasted meats. Vegetables (raw or steamed) or cottage cheese/salad. By current standards, it may be crazy to consume between 12-36 whole eggs daily, but it has been proven to be safe in studies, as fat has been determined not to cause increased triglyceride levels. In fact, triglyceride levels are the most powerful indicator of heart disease, and are ironically worsened by high sugar intake! The hormone precursor shake/diet is perfect for anyone seeking to gain lean mass, but especially hard gainers who require an immense number of high-quality calories to gain weight. Gironda even postulated that consumption of high-quality fertile eggs in bulk was equivalent to using the steroid Dianabol in terms of its anabolic potential! As if that was not enough, eggs also contain omega-3 fatty acids as well as CLA (conjugated linoleic acid), which further increases testosterone levels, as well as reducing fat mass. Let’s not forget to mention their capacity of vitamins A, B, D, E, Iron and Zinc making for a super potent anabolic cocktail. CLA supplementation is highly advised while trying to gain muscle and lose body fat simultaneously. Though downright pretty straightforward, the steak and eggs diet was his most popular one by far, utilized heavily during contest prep. It was warmly referred to as the “Maximum Definition Diet” since it allowed for users to dial down to extremely low body fat levels, while still keeping muscle mass and vascularity. Gironda himself stayed on this diet for long periods of his life. This diet is ketogenic at its origins, but ketogenic diets were not well known during the time Vince Gironda advocated using it. All he knew is that it simply worked and was the best diet for fat loss. This clearly highlights the fact that he had a rare thinking style, using the diet on himself and observing its effects before promoting its use. What made it go even further against the norm was the fact that during this time mainstream health experts had started to demonize saturated fats and cholesterol as the cause of heart disease, even though this was later disproved. Vince did not care about this and was smart enough to base his assertion of this diet due to the fact that the Inuits of the Arctic lived on diets consisting almost exclusively of animal foods for millennia without ill effect, and in that case, surely anybody could do it as well. The diet consisted of two meals daily, eating as much as desired at those sittings. Regarding beverages, water and black coffee were accepted, since they both have a modest effect on metabolism without yielding any calories or carbs for that matter. On the fifth day of dieting a high carb meal was allowed (what we usually call a cheat meal) with the purpose of refuelling muscle glycogen to be able to train harder. We today call this protocol the cyclic ketogenic diet (CKD) even though back then it was not recognized as such. Did you know that liver is the most nutrient-dense food on the planet, even surpassing fruits and veggies in almost everything except vitamin C content? This is why wild carnivores such as lions often consume the liver of their prey before anything else, and also why Palaeolithic hunters also prized consumption of this organ meat. So why isn’t more liver consumed today? It could very well be due to the huge diversity of foods we now have available at our local supermarket, or because few naturally acquire a taste for liver. That is why desiccated liver tablets are amazing and were among the only bodybuilding supplement that Vince Gironda would recommend. When consumed in-between meals, liver tablets help keep the body in a positive nitrogen balance, promoting anabolism. Why liver? Among its superior nutrient profile, the liver also contains the rare cytochrome P-450 family of enzymes, which promote steroid hormone synthesis and facilitate optimal detoxification in the body. Studies conducted in rodents fed liver found that their endurance kevels were significantly enhanced during swimming tests, although the exact mechanism is not known. If anything, though, this effect may favorably carry over into humans consuming liver. Liver consumption is also able to remedy anemia, a condition characterized by a low red blood cell count that causes low energy levels and can even cause erectile dysfunction. This alone should make liver very important to you! Vince Gironda will forever be known as The Iron Guru, the man who revolutionized training and the sport of bodybuilding as a whole. Many still worship his philosophies as they are still applicable up until this day; in particular for those who want to naturally gain the most muscle mass to sculpt the perfect, most aesthetically pleasing physique. We don’t know about you, but we have a serious man crush for Vince!